Make a large batch of this flavorful water and you can drink it throughout the day, all while revving your metabolism with grapefruit and green tea. 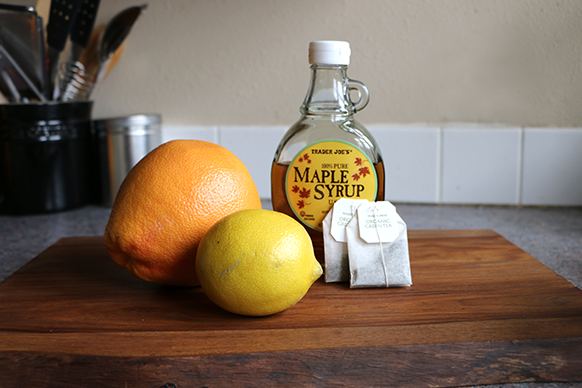 Maple syrup is optional and adds 50 calories to the recipe, but its sweet flavor helps to balance out the acidity and makes the drink more enjoyable. Infuse for 2-3 hours at room temperature, then remove the tea bags. More details below. Add 1 tbsp of maple syrup (the “real” stuff that is labeled Grade A, not grocery store brands that are mostly corn syrup) to the bottom of your pitcher. Add a 1/2 cup of water and swirl until mixed. 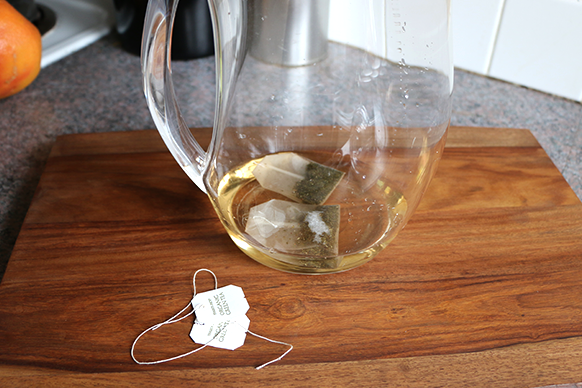 Remove the paper tags on your green tea bags in order to avoid a paper-y taste, then add the tea bags to the mix. Use organic tea, if possible. Now you are going to cut off your lemon’s rind. 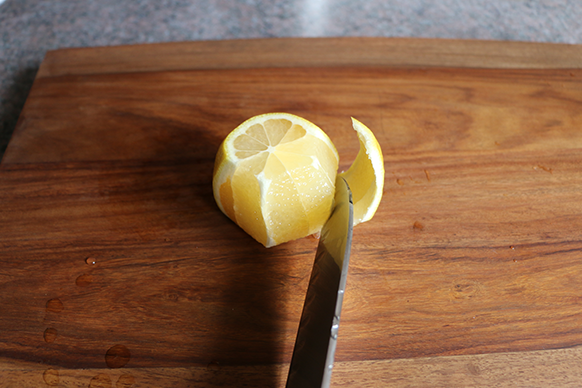 Cut the ends off and guide your knife along the lemon’s curve. The goal is to keep the lemon’s interior as intact possible. If you slice off too much, simply squeeze the extra juice into your pitcher. Why are we going to all of this trouble to cut off the rinds? Because citrus rinds taste terrible! They are very astringent and can ruin an entire batch of infused water. You’ve probably seeen pictures of infused waters with beautiful, intact lemon slices floating around, but rind-on fruit is mostly shown for photography purposes. We are almost done! 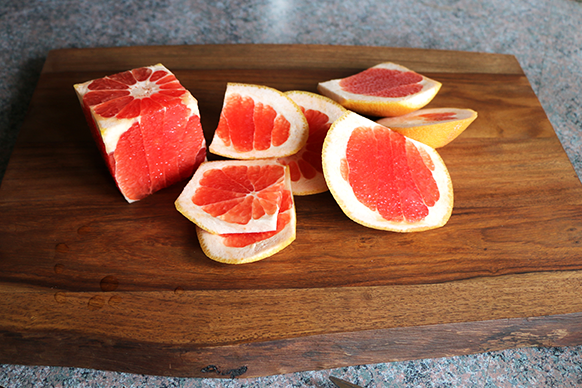 Cut your lemon into cubes, then layer them with the grapefruit cubes in the fruit infusion rod. Be sure to pack the fruit tightly. You may have some fruit left over. If so, you can take the leftover fruit and muddle it into the bottom of glass then add fizzy water for an instant infused water. Or, you can save the fruit for later if you want to freshen up your water by replacing the already infused fruit. Important! 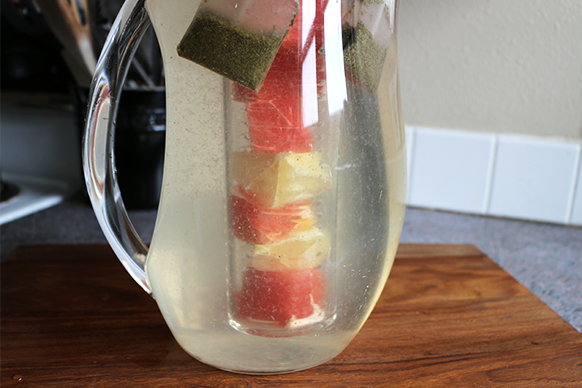 Add the water to your pitcher before adding the fruit infusion rod, then gently lower the rod into the pitcher. Pouring water over the fruit will cause the lemon and grapefruit to release hundreds of tiny floaters. Some of this fruit particulate will be released no matter what you do, but we might as well try to minimize the effect. Leave the water to infuse at room temperature for 2-3 hours. Room temperature will help the tea to brew. 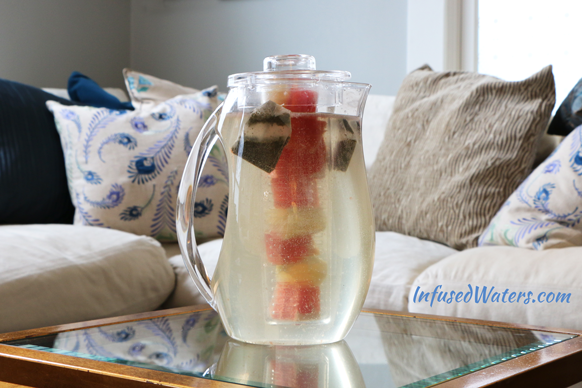 After this time, remove the tea bags and keep the infused water in your fridge for up to 2 days. It’s important to remove the tea bags because they will eventually overpower the fruit flavors. If you plan to infuse this water in the fridge for 8 hours while you go to work, simply use 1 tea bag instead of 2 to lessen the tea flavor. Health tips: if you sub 1-2 cups of green tea for one can of soda, over the next year you’ll save over 50,000 calories. Also, eating lycopene-rich foods, such as pink grapefruit, and drinking green tea may greatly reduce a man’s risk of developing prostate cancer. In a study by the Asia Pacific Journal of Clinical Nutrition (Jian L, Lee AH, et al.) involving 130 prostate cancer patients and 274 hospital control groups, men drinking the most green tea were found to have an 86% reduced risk of prostate cancer compared, to those drinking the least. Regular consumption of both green tea and foods containing lycopene result in a synergistic effect, stronger than the protection afforded by either grapefruit or green tea alone. Hello! does this work for a regular water bottle? Like, a shakeology cup type thing. thats what I use. I would just half the recipe right? Most of your recipes are for pitchers larger than what I have at the house. I don’t have any 93 or 84 pitchers or infusion bottle. How much of the do I use for 53 oz 2 qt pitchers. Hi, Shawn. If your pitchers are half the size, the best thing to do is half the recipe and see if you enjoy the flavor. Then, the next time you make the recipe, you can add more fruit to taste. good day! 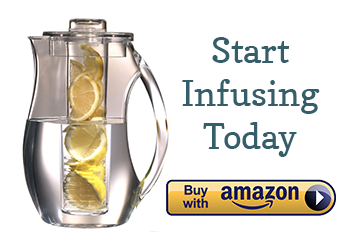 its nice to start 2016 refresh and healthier by using this fruit infusion pitcher , is this available at amazon ? Hi, I like this site very much, I have switched to infused water recently ,but my problem is the place where i live there organic fruits are hardly available so what should I do? And. Can we add veggies also? Can you use honey instead? Would it be healthier and still add just enough sweetness? 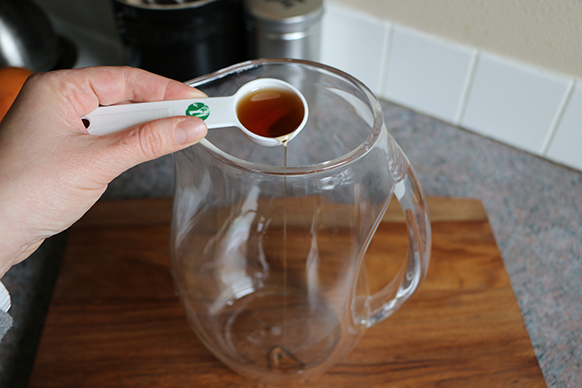 I use 1 tsp of honey in all my infused waters, honey cures so many things, number 1: 1 tsp of honey stops heartburn, and uoset stomach no no more over the counter pills! Orange, lemon, and lime go great. Here at Infusedwatertower.com we tried this flavor and it was extremely tasty. It was a hot summer day and all of the employees kept returning to the tower just for more. We would definitely recommend trying to make this flavor, you will not be disappointed. We are going to continue to create this infused drink to put in our tower. Do beets, cucumber, and pineapple. I removed the tea bags after 3 hours and then left the fruit in for another 20 hours. At this point, the infusion tasted good with a strong fruity flavour and not too bitter with the green tea. However, after another few hours, the fruit flavour faded and was overpowered by the taste of tea. Have you experienced fruit flavours fading over time once the fruit has been removed, especially if part of a cold brew tea? Would sealing the bottle reduce oxidisation and loss of flavour?